During WWII, Americans—like people in other parts of the world—were subject to rationing of items like gasoline and food. Encouraging U.S. citizens to grow—and preserve—their own food, the federal government hired artists—such as Alfred Parker, who created this poster during 1943—to be as self-sufficient as possible. Public-domain image online via the Library of Congress. American students learned how rationing worked in the class room. Ration books had point values, and children were taught the "whys and wherefores" of such items as "Ration Book II." 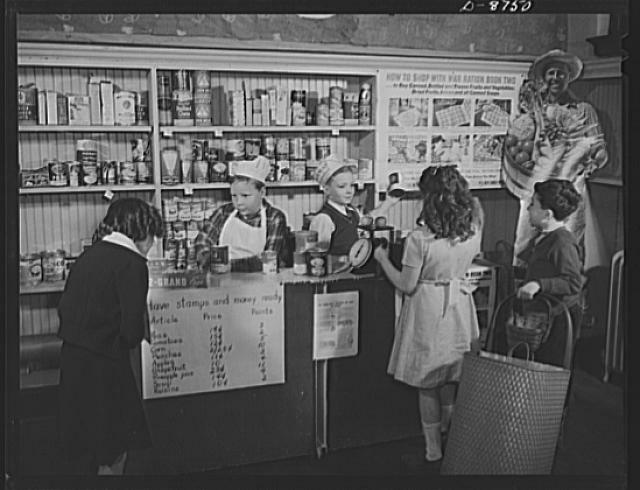 Children, just like their parents, used ration cards at local stores. As they were during WWI, children were specifically asked to help in America, while even small children in Great Britain, during WWII, collected food scraps for pig farms. Americans, like Brits, grew victory gardens wherever there was available space. From gardens in Florida to gardens in New England, people everywhere pitched-in to help. Salvage drives, in the U.K. and elsewhere, encouraged people to gather their recyclable materials together in one place. So much material was collected (like these piles in Butte, Montana) that it could not all be recycled, although spent kitchen fat was used to make glycerin (an ingredient in explosives and drugs). Be sure to "lick the platter clean." As German planes bombed their country, British school children were forced to study in air raid shelters while infants wore gas masks. More than 7,500 U.K. children were killed by enemy action during World War II while countless others were traumatized. Although children in North America were spared that agony, untold thousands had to quit school to help support their families. When one asks those children - now grandparents - what it was like to abandon their own plans and education in favor of helping out, the look on their faces answers the question. Back then, one did not put oneself first. "The Greatest Generation" had, after all, learned such lessons from their own parents. Bos, Carole "HOW CHILDREN HELPED" AwesomeStories.com. Aug 01, 2003. Apr 23, 2019.